He fishes to relax, so give him a personalized fishing bucket seat so that he can fish in style and comfort! This great fishing gift is perfect to bring along on fishing trips to keep bait and drinks cool and double as a lightweight, portable seat. Personalize the fishing bucket seat with any message you choose across the top – no more arguing over whose beer, soft drinks, or bait is inside. This sturdy bucket seat makes a great Father’s Day gift or groomsman gift for fisherman. 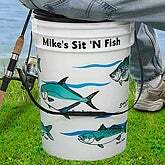 For a special touch, fill the personalized fishing bucket seat with his favorite beer or soft drink!